Make the phone send delayed SMS messages for you automatically at the time you want. Do you want to send an SMS message with a delay at a particular time? Schedule it with this message scheduler app! Or maybe you want to schedule some messages to be sent repeatedly as a reminder. This SMS message sender will help you with all that! You might be asleep at that moment, be at the lecture or at a job interview. This app will send the message you ask at the time you ask. The app will also let you schedule messages to be sent multiple times, once in a while (repeatedly). Maybe you want to notify your coworkers every week about cleaning the kitchen? Or text your flatmates to take the trash out once in a while. 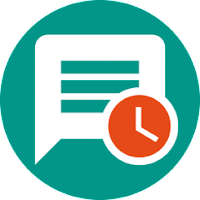 This SMS sender app will help to schedule and automatically send SMS messages with delay or periodically! Try this free SMS sender and don't forget to leave the review! Support of more texting services, like Whatsapp coming soon in the next versions. Feel free to suggest new features/improvements/ideas/anything. The cost of sending SMS messages varies depending on your mobile operator plan(tariff). Sending more messages than included in your plan may incur extra charges.